The Da Vinci Code is one of my favorite books, and I was pretty disappointed with the movie. 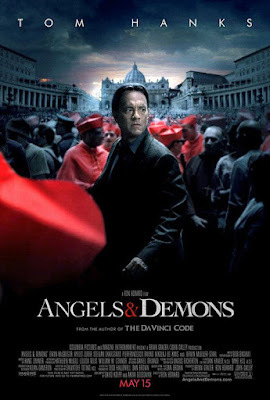 For this reason I wasn't sure if I was going to see Angel's & Demons, even though I had just recently finished the book. Yesterday afternoon I had some time to kill before meeting up with friends, (which you can read all about here) and decided to go see it. I am happy to report that I really enjoyed the movie! They changed it quite a bit, but I liked the changes and I think it made for a better movie. I'm really glad I decided to see it after all. There is something quite decadent about leaving work early to take in an afternoon movie by yourself and I'm sure I'll be doing that again in the future. bizarre....that he knew how to fly the helicopter and then parachuted to safety? It lost me there although I didn't read the book. You obviously missed the part of the movie and book when he told the story of how when he was old enough he volunteered in the army and was a pilot..... ;)! I loved the book. When I read the book 3/4 years ago I thought it was the best book I ever read. A thousand times better than the Da Vinci Code. It is still the best book I ever read. I was disappointed with the movie. It didn't hold a candle to the book. I always miss parts and don't get the whole picture when I go to the theatre to see a movie. I will watch it again when it comes out on DVD. Maybe I will like it more then. Glad you enjoyed it. I haven't read the books yet.